Earlier in the month it was my birthday. I decided to try and improve on my cake from two years ago, orange and chocolate cake. Here is the revised recipe with a few additions! Sorry I haven’t been posting much recently, life has been a bit hectic with lots of changes, which I will update you on at some point! I would love to hear if you try any of my recipes! Start by making the orange cake. Grease and line two 20cm cake tins. Sieve the flour and baking powder into the mixture, then carefully fold into the mixture until everything is well combined. Finally, stir in the orange juice and vanilla extract. Bake in the preheated oven for 25 minutes or until a skewer inserted into the middle comes out clean. Next, make the chocolate sponges. Grease and line another two 20cm cake tins. Sieve in the dry ingredients and mix until everything is combined. Finally, stir in the milk. Once everything is combined, divide the mixture evenly between the two prepared cake tins and bake in the preheated for 30 minutes or until a skewer inserted into the middle comes out clean. Allow the cake to cool for 5 minutes before turning out onto a wire rack to cool completely. While you are waiting from the cakes to bake and cool you can make the chocolate ganache. Break the chocolate into small even pieces and place at the bottom of a heatproof bowl. In a small saucepan, heat the cream over a medium-high heat until it reaches a boil. Allow to simmer for 1 minute. Then take off the heat and allow to cool for a further minute. Pour the hot cream over the chocolate pieces and whisk together until you have a smooth glossy mixture. All to cool to room temperature before putting in the fridge to set to a spreading consistency. When you have cool cakes and ganache which is a spreading consistency, level the cakes if necessary. 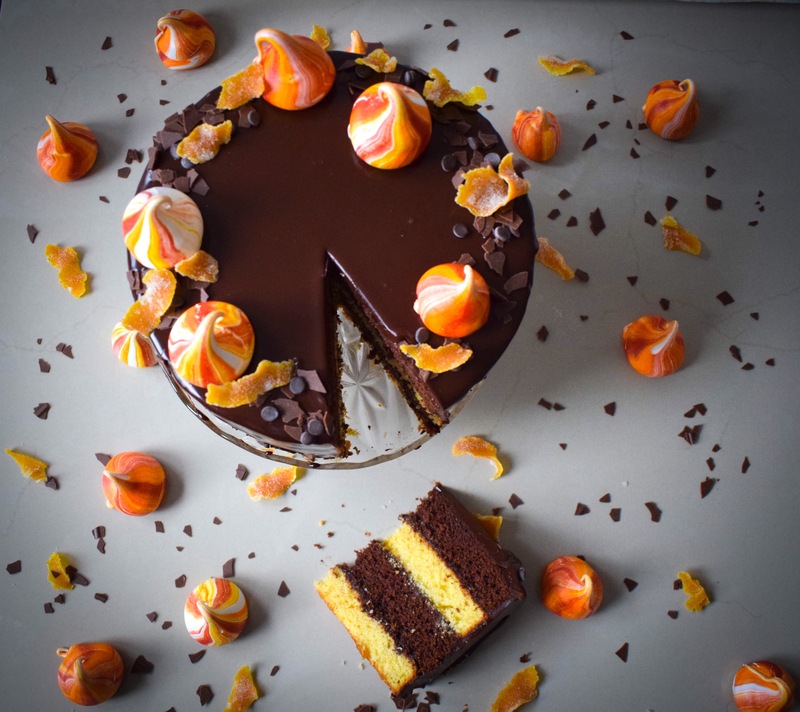 Place one orange sponge onto your cake board and apply a generous layer of chocolate ganache. Smooth right to the edges. Top with 2 tbsp of orange curd and again smooth to the edges. Top with a chocolate sponge and repeat the process, alternating types of cake, until you have used your last cake. Place in the fridge to set for 15 minutes. Next cover your cake with chocolate ganache. Smoothing over the top and side with either a cake scraper or palette knife. Reserve a little if you want to create drips down the side of your cake. To make the drip, heat the leftover ganache in a microwave in 10 second bursts until it is a runny consistency. Pour over the top of the cake and encourage it to drip down the sides with a teaspoon. Give the cake and cake board a few quick taps on the work surface to get rid of any air bubbles and give a really smooth finish. Decorate with meringue kisses, candied orange pieces, chocolate shavings and chocolate chips if desired.